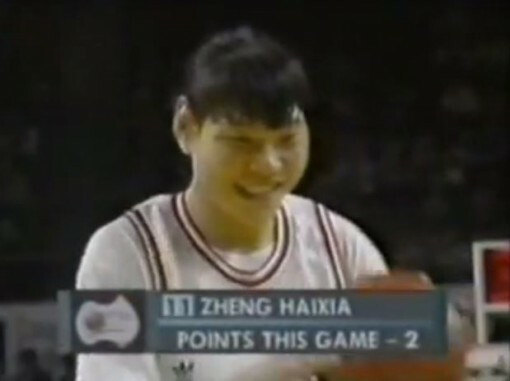 Haixia Zheng: Whatever Happened to the 1st Chinese WNBA Player? Now retired, Haixia Zheng (pronounced Hi-Shaw Jheng) was a 6-8 center from China and the first Chinese player to play in the WNBA, and the first Chinese player, man or woman, to play professional basketball in the United States. Not Yao Ming. Not Jeremy Lin. Not Wang Zhizhi. After competing in multiple international tournaments, including four Olympics, since the age of 12, Haixia Zheng is known to be the best woman basketball player in China’s history. Over her long international career, the center with the size 18 shoes has garnered several titles and accomplishments including an Olympic silver medal (1992) and Bronze medal (1984), another Silver (1994) and Bronze (1983) in the World Championships for Women, winning the Asian Games (1986, 1990, 1992, 1994, 1995, 2001, 2004, 2005), 1st in the World University Games (1986, 1992). She would also take home championships for the East Asian Games (1992). She came into the WNBA during the league’s inaugural season as a happy go lucky giant, easy to smile and a fan favorite for the Los Angeles Sparks team. Often the fans would give her a standing ovation for her work around the basket. Because of her size, she wasn’t the quickest players, but a highly-effective scorer near the hoop. Haixia was the first receipient of the Kim Perrot Sportsmanship Award. Even 15 years after the end of her WNBA career (she would go on to play with the Chinese National Team) she is second all-time in career field goal percentage at .619 (rookie Markeisha Gatling is ahead of Haixia, so let’s see if Gatling can keep it up throughout her career). Zheng played only two seasons with the Sparks. On June 18, 2010, Zheng got married to her husband Xu Qinghua, a civil servant, in Beijing. We all know you’re wondering, Xu is 6-foot-1, a full seven inches shorter than Haixia. A happy ending considering the union came after several unsuccessful romances, and the fact that Zheng turned down many suitors because of their height. This followed a romance that was broken up because her then boyfriend couldn’t stand to live in her shadow, despite being an inch taller at 6-foot 9. Even as her basketball career slowed and stopped due of knee injuries, Haixia remains a huge celebrity in China. Now 47 years old, she continues coaching the Chinese PLA team (People’s Liberation Army), enjoys fashions and needlework, and collects perfumes from around the world.